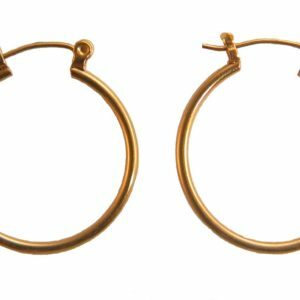 Earrings for sensitive ears in Gold Love Knot Earrings: Hypoallergenic gold earrings are an excellent choice for anyone starting out with pierced ears. Whether they have been recently pierced or have been wearing pierced earrings for a while now, hypoallergenic gold earrings are ideal. You’ll find that they are durable, lightweight, easy to care for, and affordable. Gold knot and post made from a base of high grade surgical stainless steel and then electroplated in a thick layer of pure 24K gold. This combination of materials and construction produces a high degree of safety in our hypoallergenic earrings. The Gold Love Knot Earrings are a favorite for people at all stages – great for newly pierced ears or to keep the piercings healthy and open. Size: 15mm wide x 15mm long (19/32 inch wide x 19/32 inch long).